The Stupa of Borobudur in Java is one of the architectural wonders of the world, designed as both a mandala and as an aid for the Buddhist pilgrim that can be read as a holy book. 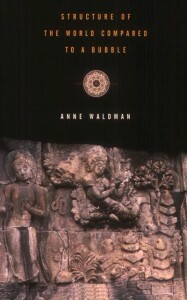 It has inspired Anne Waldman to create a work which is at once a walking meditation, a “cultural intervention,” a “recovery” of a sacred site, and a take on contemporary reality and how the busy “monkey brain” (as it is called in Buddhism) works and travels. Exploratory and meditative, even playful at times, it expands the sense of invocation and incantation that Waldman is celebrated for, while also reflecting an engaged political/cultural awareness.